Pantone’s website features a search engine spanning every single Pantone® color they offer. Since you’ll be viewing them on a computer screen, this tool isn’t the ideal choice for previewing a color you intend to use. It’s very useful, however, when you already know the name or reference number of a specific color you like and want more information about it. Simply enter the color name or number into the field and click “Search.” You’ll be able to see a sample of the color along with a listing of the Pantone® color books it can be found in. 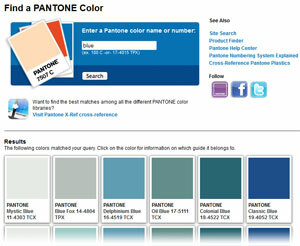 You can also search for specific terms such as “blue” to see the Pantone® colors with names that include that term. To go to the pantone® website to search a color. Please click here. Say you’ve got a Pantone® TCX color you really like, and you want to use a similar color in metallic ink, neon ink, or another Pantone category. This is the tool for you.With X-Ref, you can select a color from one Pantone color guide and find the color that most closely matches it in another guide or system. Start by clicking “PANTONE Color Guide” and selecting the book that contains the color you’re referencing. Then, click “Color” to browse the colors in that book and select the color in question. 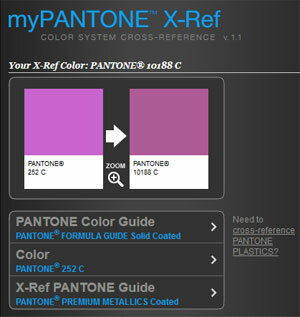 Finally, click “X-Ref PANTONE Guide” and select the book in which you want to find a matching color. Please note that this is just a reference. No Pantone® system can be compared to the other, it is just the closest match. We always advise to have physical samples to check for yourself. To go to the pantone® website to make a cross-reference. Please click here. Should you have any questions, please contact us via info@appletizer.nl ofr020-5305380. We are glad to help you.